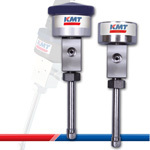 KMT Waterjet offers the most extensive line of abrasive water jet intensifier pumps to provide maximum performance and maximum productivity for your needs. 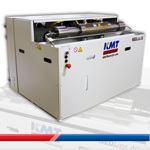 Next to the high-performance pumps of the STREAMLINE PRO series, KMT's product range also includes a variety of high pressure pumps for basic waterjet cutting needs which operate at a maximum working pressure of 3,800 bar. The KMT Waterjet is the most recognized waterjet pump around the world. Our pumps, integrated with our OEM waterjet tables, are technologically advanced high-performance devices known for their excellent reliability, efficiency, user-friendliness, intelligent design and are suitable for all waterjet cutting applications. 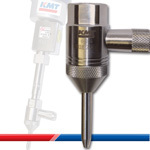 The best possible reliability as well as simple and quick maintenance are the key features in the development of all KMT high pressure products for waterjet cutting. The simple modular design enables the replacement of every single wear part. This design principle ensures that each component can be used to its maximum lifetime. 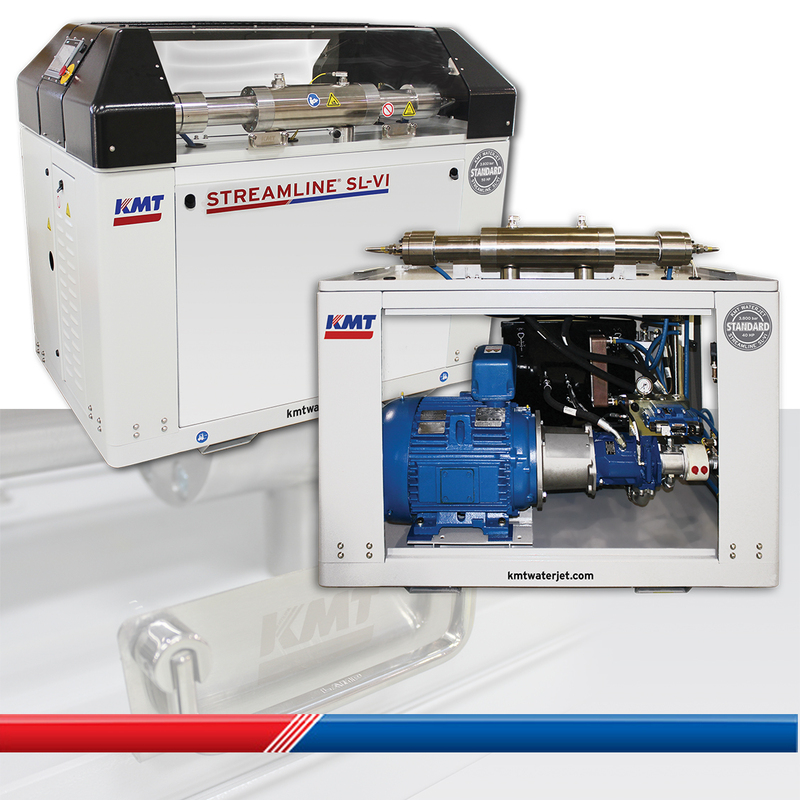 For application which do not require a maximum pressure of 4,136 bar, KMT WATERJET SYSTEMS offers the STREAMLINE SL-VI STD high pressure pump as a lower priced alternative still featuring KMT's advanced pump technology. The STD models can be operated both independently as a stand-alone unit or communicating with the central control system of the entire cutting machine. The STREAMLINE SL-VI STD is designed for flexible production in pure water as well as in abrasive applications. It is dedicated to those kinds of cutting jobs which require cutting pressure of up to 3,800 bar. The high reliability and lifetime performance equal those of our more sophisticated PLUS models. As both pump models SL-VI PLUS and SL-VI STD are based on the same technology and the same frame, operators of an STD pump can benefit from the advanced hi-tech design of the PLUS model. By choosing different configuration possibilities, the pump can be customized to fit the operator's demands. The NEOLINE NL-I 40 High Pressure Pump features KMT‘s proven and reliable SSEC intensifier technology in an affordable entry-level product, thus offering a great value at a reasonable price. It is the perfect solution for everyone who is looking for an economical waterjet cutting solution for occasional cutting needs using the best technology the industry has to offer. The NEOLINE pump has been developed with the aim of creating a robust, easy to operate pump. It is driven by a 40 hp (29 kW) three-phase motor which is equipped with vibration isolation pads to protect the rest of the pump from the motor activity. Furthermore, the NL-I 40 features a rugged powder-coated finish protecting the surface from environmental influences. For ease of operation, the KMT engineers developed a new low profile cabinet design which grants easy access to the pump controls and other components. Our AQUALINE I pure water cutting head has gained an industry-wide reputation for being amongst the quickest and the most reliable pure water cutting heads under extreme working conditions, through fastest reaction times and high component lifetimes and quality. The multiple cutting cycles found in these industries place huge requirements on the on/off cycle speed and reliability of the cutting valve. The KMT AQUALINE I provides the industry‘s top quality leading solution in this area. Depending on the application, normally closed (N/C) and normally open (N/O) cutting valves are available. The nozzle valve opens in less than 50 ms depending on the operating pressure. The AQUALINE I head weighs only 1.8 kg (3.9 lbs) guaranteeing high flexibility and making multi-head and 3-D applications easy. It can be equipped with both sapphire and diamond orifices, whatever fits the individual process needs best. With the cutting heads ACTIVE AUTOLINE II and ACTIVE IDE II for abrasive waterjet cutting, KMT Waterjet Systems has developed abrasive cutting head assemblies that provide the best efficiency by utilizing long life components. Thus, maintenance efforts can be reduced and running times extended. The patented tool-free attachment allows for the quick exchange of the water and focusing nozzles without the need to dismantle the abrasive feed hose. 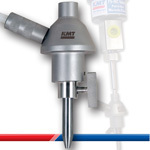 The unique non-metallically welded nozzle base caters for high precision and repetition accuracy. 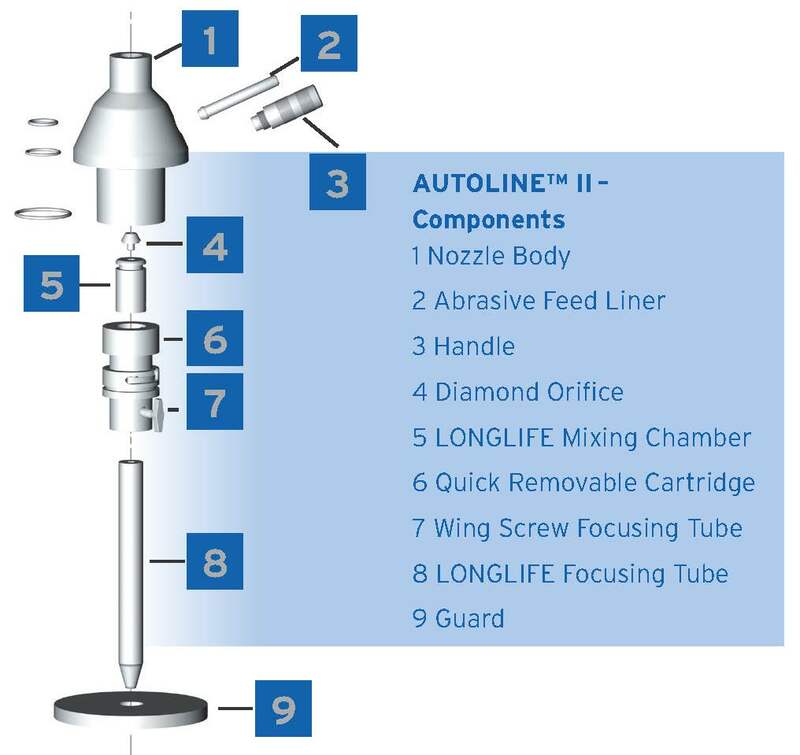 The AUTOLINE™ II cutting head includes only three wear parts, namely the orifice, the mixing chamber and the focusing tube, which are made from extremely wear resistant materials. The nozzle body consists of an exchangeable insert. If worn, simply replace the mixing chamber. Pure-water cuts can be made with the same orifice, so retooling takes only a few seconds. As the cutting head contains a minimum number of individual components, it is particularly easy to handle while producing high-precision cuts. Important features are the low maintenance effort, the exact targeted cutting jet, the pre-filter protecting the orifice and the advanced nozzle valve design. 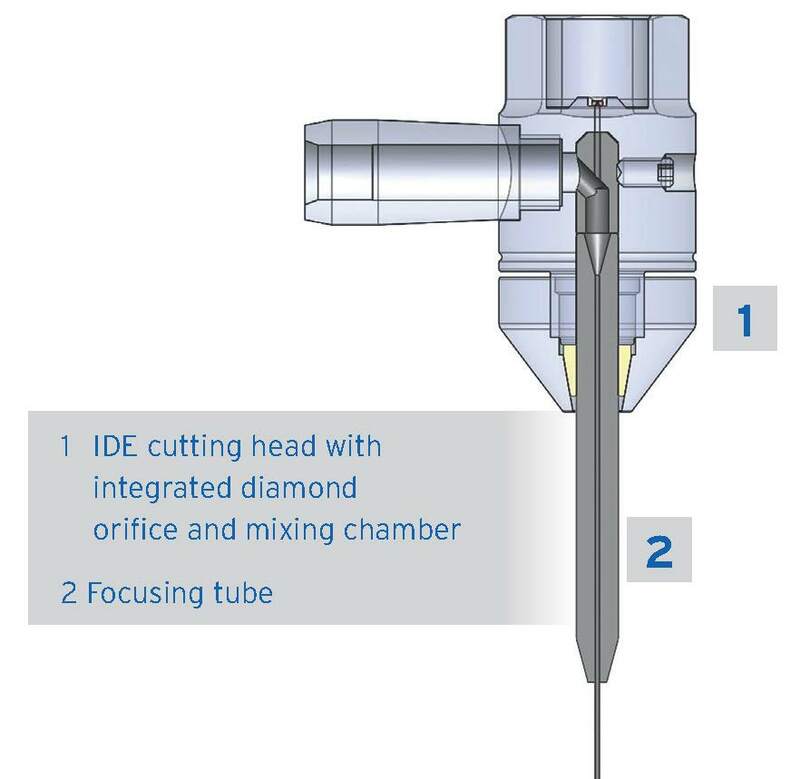 The diamond orifice and the mixing chamber are combined in a single nozzle body. Both professional users and workers who have only recently been introduced to abrasive cutting benefit from the simple design of the unit as the focusing tube and the pre-filter, which are the only wear parts, can be exchanged easily and quickly.